I've been discussing the declining number of power plays in the post-lockout era and the dangers for teams built with a heavy reliance on them for over a year now, so I thought I’d take a different approach to demonstrate what’s happening across the NHL. Looking at the NHL’s Top 100 point producers each season, before and after the lockout, exposes a stunning pattern when their collective stats are averaged out to an 82 game season. Power play point production from the NHL's best has now dropped 46% since 2005-06 and has now declined into territory not seen in decades. Meanwhile, even strength point production has steadily risen 12% over the same period of time. The 6 year average prior to the lockout saw the Top 100 score 63% of their points at even strength, 35% came on the power play and 2% short handed. 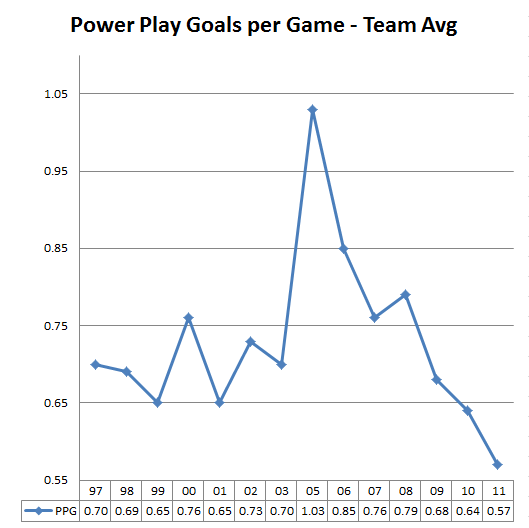 With the steady decline in power play opportunities, 2011-12 saw the Top 100 depend on even strength scoring for 70% of their point total while 29% came on the power play and 1% when shorthanded. 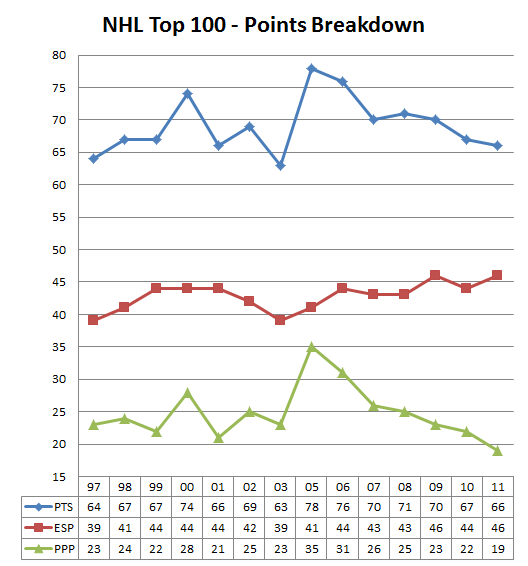 The sharp decline in the Top 100’s power play points is a direct result of fewer penalties being called, not shooting percentages or other nonsense people have used to justify weak arguments. There simply isn't anywhere near as many penalties being called in the first place. In fact, you’d have to go back almost 30 years to find teams averaging less than 3.31 power plays a game, a staggering 43% decline since the lockout ended. The obvious result is a lot more of the game is now being spent at even strength and the Top 100 are getting a greater percentage of their points from it. Meanwhile, players who historically relied on heavy power play minutes to generate 40%+ of their point totals have been suffering. Badly. You’d be hard pressed to survive a high fall from the angle of decline already present when GM Bob Gainey and Pierre Gauthier retooled prior to the 2009-10 season. Jacques Martin had significant input over the players he wanted for a system dependent upon special teams and goaltending, including Scott Gomez. Small, fast, open-ice players who’d keep the opposition honest with a potent power play. 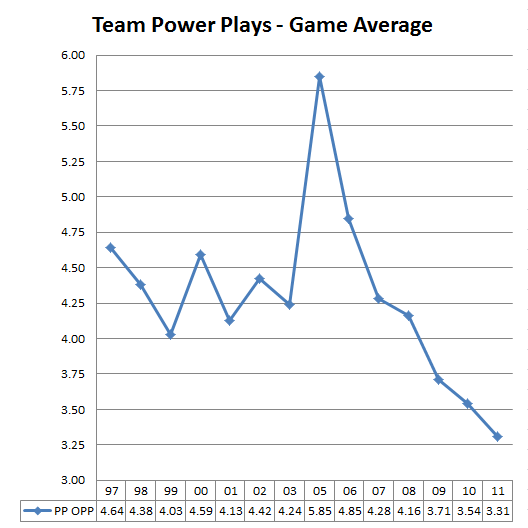 What power play? Marching in lock-step with fewer power plays and fewer power play points for the NHL’s top offensive players has been the sharp decline in the average number of power play goals being scored per game. Teams are on pace to average 45% fewer power play goals scored per game since the lockout and yet again, you’d have to go back decades to find a time when teams were forced to score more at even strength to win hockey games than they are now. 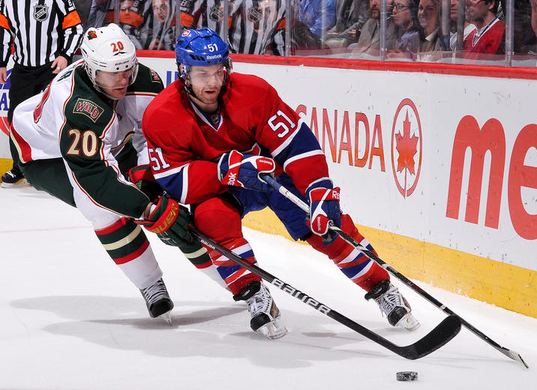 For a team like the Montreal Canadiens that’s consistently been in the top echelon of the most power play dependant teams in the NHL, they face the likelihood that within 2 years, teams will be trying to win games while averaging just 1 power play goal every 2 games. Talk of power play success rates and shooting percentages are near pointless when you stand back and look at the larger problem. If the Habs don’t have a full understanding of the NHL landscape when they retool this time, talk of lottery picks might become a lot more common because the days of the power play specialist are over with 82% of hockey games being played at even strength.